Went to the Tallyrand for lunch with my friend Cassie. 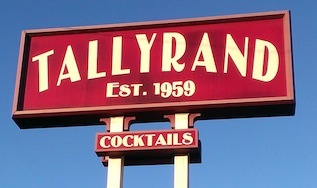 I thought I’d eaten at the Tallyrand once and hadn’t been that crazy about it, but since it was on the list I was ready to give it another go. As soon as I stepped inside, I knew I’d never been there before. That was some other place I didn’t like much. I have no idea what that other place was. Categories: Restaurants | Tags: 1959, burbank, Coffee Shops, historical burbank, historical L.A. | Permalink. Hoping to escape the horrible heat, I headed towards the beach and ended up at The Shack. It didn’t have air conditioning, but lots of fans and open windows and the ocean breeze made it much cooler than Burbank. Categories: Restaurants | Tags: 1972, Beach, historical L.A., historical los angeles, Playa del Rey | Permalink. 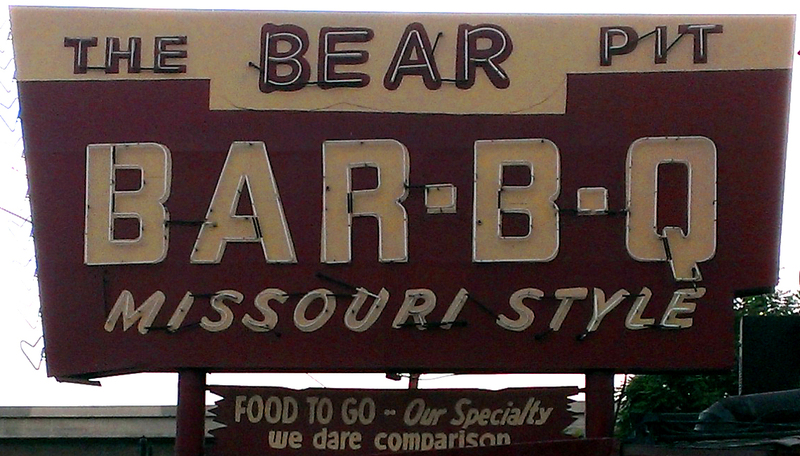 As an early birthday present, my friend Corey took me for “Missouri-style” barbecue at The Bear Pit, which was pretty much the most awesome thing he could have done. Categories: Restaurants | Tags: 1954, Barbecue, historical L.A., Los Angeles, Mission Hills, Restaurants | Permalink. Went with David (my husband) to The Great White Hut. There’s something I love about burger stands, they’re so compact and self-contained. 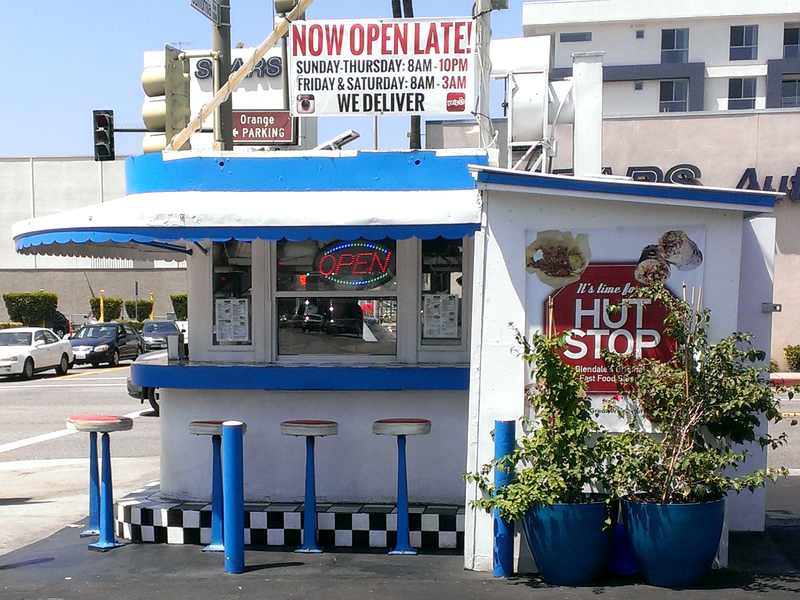 Categories: Restaurants | Tags: 1947, burger stand, Glendale, historic glendale, historical L.A. | Permalink. Had a dentist appointment, so to cheer myself up after I went to one of my favorite places on earth, the Original Farmer’s Market in Hollywood. This isn’t the regular sort of farmer’s market where people set up tables one day a week, but a permanent structure (actually several structures sort of hunkered together with open areas in between them, but inside it feels like you’re in one structure with an odd roof that doesn’t cover everything, and also sort of like you’re still outside) that has been here since 1935. Inside is a jumble of food stands and stalls and little stores selling tourist tchotchkes, hats, hot pepper sauce, toys, stickers, scented candles, candy, ice cream, and of course fresh fruits and vegetables. There are dozens of places to eat and every where are round tables with different-colored tops and folding chairs and it’s always packed full of people and it’s just marvelous. It’s mentioned in the book Weetzie Bat by L.A. siren Francesca Lia Block, which I read before I moved here (and was one of the reasons I did), and I was thrilled to find it right across the street from my first Hollywood apartment. It is, to me, the very best thing in Los Angeles. Categories: Restaurants | Tags: 1934, farmer's market, historical L.A., hollywood, Los Angeles, retro, vintage | Permalink. 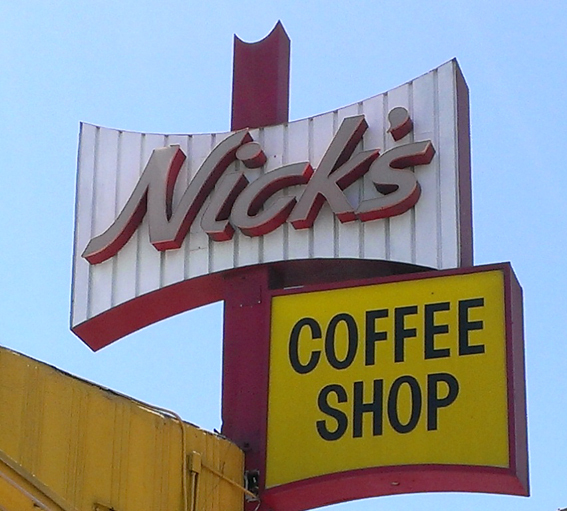 Walked to Nick’s Coffee Shop for an early lunch. I wondered why I’d never been there before, as it was fairly near where I used to live, but wasn’t surprised when I saw how tiny and tucked away it is. It’s a shame, though; I would have gone there at least once a day. Categories: Restaurants | Tags: 1946, Coffee Shops, counter, Diners, historical L.A., Los Angeles, Restaurants, retro, vintage | Permalink. 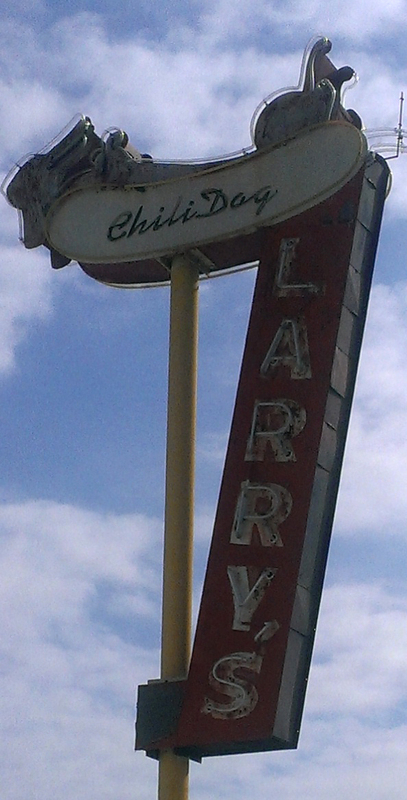 Went for a late lunch with my friend Corey at Larry’s Chili Dog. I’d often admired the chili dog sign and had always assumed it was a regular restaurant, but when I got past the row of hedges that hide it from the street I found a walk-up order window and some tables and chairs outside under an awning. It was a very hot day, but their clever placement of bushes and umbrellas made enough shade that we were quite comfortable. Categories: Restaurants | Tags: 1953, burbank, historical L.A., hot dogs, retro, vintage | Permalink.